Last week saw the release of Firefox 3.0, and an attempt to set the record for most number of downloads in a 24 hour period. This struck me at the time as a record on par with, lets say, the most number of pies eaten by a man named Kevin while standing on one foot, in that I couldn't imagine that it was a record that had existed before Mozilla tried to break it. In any event Mozilla were claiming over eight million downloads by the end of the day, a pretty impressive feat. Needless to say I was not one of those downloaders, preferring the yummy goodness of Camino 1.6.1, or as the US National Pork Board would say, 'the Other Mozilla Browser". I used to use Firefox many moons ago, but from 2.0 on I found it slow and lethargic, more of bloatwear than anything else, and I switched to the lighter healthier Mac-only alternative. I don't like Safari, I'm not a fan of the interface, don't like the lack of customisation and add-ons, and have never been a fan of monopolistic integrated OS & Browser experiences. Although nobody could accuse Apple of unfair practices with bundling Safari with their Macs given the overall market share Apple has in the PC business, the same cannot be said for the inability to use any other browser on the iPhone or iPod touch. Out of curiosity I pulled the data for a week's worth of unique visitors to my blog (above), which says more about the readers of my blog than of internet trends in general. IE Explorer had just under a 75% market share in April 2008, according to NetApplications, whereas it only accounted for about 28% of visitors here. 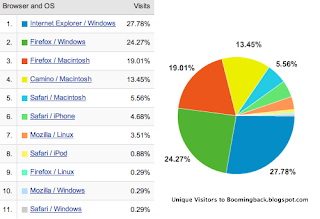 Firefox accounts for 43% of traffic across PC/Mac/Linux flavours, Camino 13% desktop Safari 5.5%, and interestingly enough Mobile Safari on iPod/iPhone accounts for about 5% of all traffic. That's a pretty significant number, 5% of all my traffic is from mobile users, and Opera (as used by Nokia and others) or Windows Mobile accounts for no traffic whatsoever. According to StatCounter by March of this year Safari had become the number one mobile browser in the US, and number two globally after Opera, less than a year since launch. Much of the growth in the US can be attributed to the fact that the mobile data market there is still in its infancy with the iPhone being the first mobile data product that many users had owned, and by March the iPhone only accounted for .23% total browser share in the US. As long as mobile data remains such a small market, Apple's dominance is unlikely to attract the attention of the regulators, but with the launch of the iPhone 3G and the increasing adoption of mobile browsing by users, it can't be too long before someone in a grey suit figures out that Safari's dominance of the mobile market is as unhealthy and questionable as the bundling of IE with Windows was in the 90's.